Belleek anniversary plate features the Claddagh and Celtic knots along with an Irish blessing. This Belleek blessing plate was introduced in 2018. 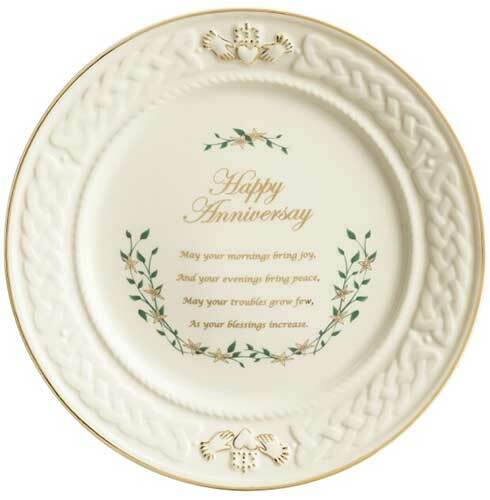 The Belleek anniversary plate features an embossed Claddagh and Celtic knot-work motif along with an Irish blessing that celebrates marital bliss. The Belleek blessing plate is made of fine china that is enhanced with gold accenting along with a floral design. The Irish blessing plate measures 9” in diameter and is handmade in Belleek, Ireland. The Belleek blessing plate is gift boxed with Claddagh and Celtic knot history cards, complements of The Irish Gift House. Irish wedding blessing plate from Belleek features hand painted shamrocks.